Caption slip reads: "Photographer: Gray. Date: 1958-05-25. Reporter: Donoghue. Assignment: Nurse graduation -- Bishop Johnson College. Daily. 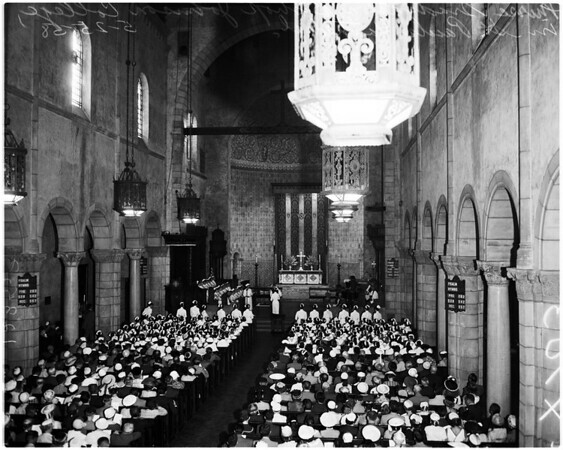 Overall shot inside St. Paul's Cathedral, showing graduation class of 48 of Bishop Johnson College of Nursing during commencement exercises. Start of procession of Biship Johnson College of Nursing commencement in St. Paul's Episcopal Cathedral. Los Angeles Episcopal Bishop Francis Eric Blow presents awards to two top graduates of Bishop Johnson College of Nursing. L to R -- Shirley Neufeld, 21, Shafter, Cal., winner of Board of Directors $3600 Scholarship".